Kona's death and the subsequent packing away of his things (more tears . . .) had me exploring both his training log and the that of Bloodhound, who is also in poor health. 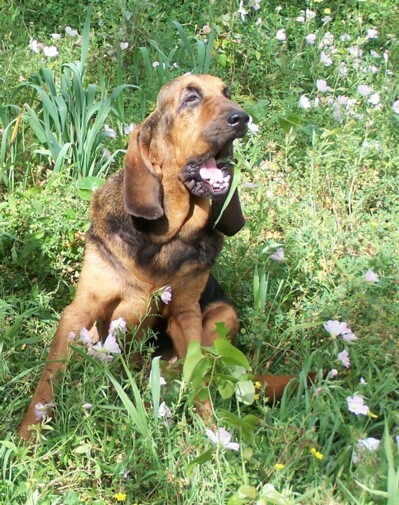 Alice the Bloodhound has taught me humility. 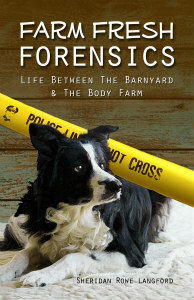 Before I got Alice I had trained all manner of working dogs, but I had never trained a Hound. My rationale was "I've trained dogs all my adult life, how hard can it be to train a Bloodhound?" Oh dear . . . Pride goeth before the fall. Alice's sole job in life was to be a mantrailing Bloodhound - she hunted people. She was bred to do that and it came as easy to her as waking up in the morning. But try to train her to do ANYTHING ELSE but mantrailing and you were setting yourself up for a humbling experience. She is HIGLY INTELLIGENT, but trainablility is another issue entirely. Simple obedience tasks were beyond her. I just "thought" I was a dog trainer until I met Alice. She humbled me, and she has taught me how to train the dogs that aren't "hardwired to please." So for two years I worked with her. She taught me to trail and I tried to teach her obedience and simple agility skills. I was astonished with how easily this puppy ran tracks. At 14 weeks old she was running 24 hour old 1/4 mile trails with crosstracks, but two years later she still had no reliable obedience skills. Then my Great Dog died. Navarre, The Great One, passed away and I was left to start over again with a new cadaver dog puppy. And THAT led me to my greatest breakthrough! 2) That's it. That's all you do. 1) Throw the ball for 2 years and watch her look at it with no interest whatsoever. 2) Get a Belgian Tervuren puppy. 3) Hug the Terv when he brings back the ball. Tell him how clever he is when he brings back the ball. Every time the Terv has the ball in his mouth, point out to everyone how clever he is. 4) Note Bloodhound begin to get jealous of Terv and ball. Watch as Giant Bloodhound steals ball from Toddler Terv. 5) Protect Unwise Bloodhound from Very Angry Toddler Terv as he steals ball back from Bloodhound. 6) Note that ball is now VERY important to both Terv AND Bloodhound. Note that Bloodhound retrieves VERY well. (huh! Whodathunkit?) Also Note Very Angry Toddler Terv when Bloodhound beats him to ball. Protect soft Bloodhound ears from Angry Toddler Terv when Bloodhound beats him to ball. 7) Put all tennis balls away to preserve harmony in the home. There is a reason why Kona's nicknames were "Attila The Hun" and "The Enforcer." He was a ruthless little beast, even as a puppy. This same bold desire to get ahead in life is probably what kept him alive four months after the vet found he was in renal failure and only gave him a month to live.